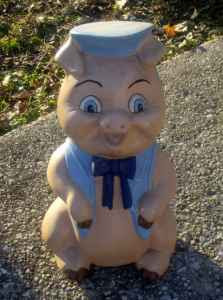 the Ad>>This cermaic piggy bank was found in my grandmothers attic. Its adorable measuring 18"tall and 9" wide. The blue hat, vest and bowtie make this piggy perfect for any pig collector. The slit for the coins is in the back of the neck and their are 2 holes with caps on the bottom for accessing the money. Would make a great gift! Merry merry oink oink! You need to march into Grandma's house and put little Lord Fontla-Pig back were you "found" him...Stealing from the elderly is wrong wrong wrong. I am sure he IS very rare, being from Cermiac, and all. I can't even find it on the map. [used to be part of Russia I think?] But asking $50 for ill-gotten stoneware...well it's highway robbery! Would you take twenty? Labels: Decorative?, Makes a Great Gift?, Useful?